Last week I picked up some awesome bargains while scrounging around the charity shops… chief among them being the second season boxset of Pushing Daisies for just five English pounds! Hurrah! The only downside to this find, now that I’ve worked my way through all thirteen episodes, is that I’m left hungry for more after the rather rushed “epilogue” they tacked on to the finale, in a dash to provide some slight sense of closure once they realised the series was getting cancelled. Boo! Apparently series creator Bryan Fuller has been batting around the idea of wrapping up the story in comic book form… or possibly a mini-series/movie… but for now The Pie Hole remains shuttered up, and closed for business. To be fair, I can understand why Daisies might have had trouble attracting the sort of ratings that other, grittier forensic shows enjoy… for one thing, it does have quite a convoluted premise and narrative structure, which necessitates an awful lot of voice-over exposition… generally I’m a big fan of stylised, “writerly” dialogue, but I often found myself becoming slightly lost here as the words flew past my ears at such a rather rapid clip. You really have to sit up and pay attention, if you want to get the full experience, and I understand how that could be a turn-off for people who’d rather just relax into a CSI-style crime-of-the-week show. No judgement! Daisies could also seem pretty intimidating for uninitiated viewers… flipping over a few episodes into a season and trying to catch up would be rather like trying to jump on to a roller-coaster that was already rollin’. But for those with the perseverance (or perversity) to buckle down and gird their brains around the rainbow-coloured, carnivalesque craziness, there’s a great deal to enjoy here. Just seeing Ellen Greene, Swoosie Kurtz and Kristin Chenoweth sharing the screen is its own reward… although sadly, they didn’t have any musical numbers together this time around. In fact, I was gravely disappointed by the dearth of singing from Greene… although Chenoweth got a few good solo numbers, including a fantastic cover of “Eternal Flame”. I know the central focus and selling point of the show is the romance between ‘Ned’ (Lee Pace) and ‘Chuck’ (Anna Friel), and I do think they make a very cute and engaging couple… but I can’t help wishing we’d spent more time with Aunts ‘Lily’ and ‘Vivian’ this time around… which is probably why their belated professional comeback in the final episode left me feeling particularly bereft. Ah well… besides the main cast, there were plenty great actresses popping up in supporting roles, as suspects and/or victims: They kicked the season off in style with Missi Pyle as ‘Betty Bee’, the founder and former spokesmodel of a honey-based cosmetics company. Meanwhile, Olive checked herself into a nunnery run by Diana Scarwid, who recurred as ‘Mother Superior’ in three more episodes… and also appeared in another of Fuller’s fantasy series, Wonderfalls (which I really want to check out sometime!). Ep #2.03 was set almost entirely around the convent, and also featured Mo Collins as the rather shady ‘Sister Larue’, whose untimely demise propels Olive back into the Pie Hole fold. Ep #2.04 found Olive and Chuck going undercover at a rent-a-friend agency called “Frescorts”, where they met the insanely cute and perky ‘Barb’, played by Dana Davis… while private eye ‘Emerson Cod’ (Chi McBride) tried to reconnect with his mother/mentor, ‘Calista Cod’, played by Debra Mooney. Oh, and Barb’s boss, ‘Buddy Amicus’, was played by Hayes MacArthur, of Perfect Couples fame. Ep #2.05 saw the return of Brit-born actress Christine Adams as Emerson’s domineering dog-trainer love-interest, ‘Simone Hundin’… who first appeared as a potential suspect way back in ep #1.06. Click-click. Kerri Kenney-Silver appeared in ep #2.06 as ‘Alexandria’, the disgruntled assistant of a famous stage magician, played by Fred Willard. Jennifer Elise Cox popped up in ep #2.07 as ‘Elise Hofer’, the rather dim gold-digging wife of a murdered millionaire. Ep #2.08 found Ned and Olive attending a “Comfort Food” cooking competition, where they encountered an unsavoury saboteur, played by Beth Grant. Fun fact: Apparently her character here, ‘Marianne Marie Beattle’, also appeared in Wonderfalls. Crossover! In ep #2.09, an investigation into the death of a lighthouse keeper brought Olive into contact with ‘Annabelle Vandersloop, a disparaging diorama-maker played by Mary Kay Place. In ep #2.10 our heroes faced off against a team of crack Norwegian sleuths, including Ivana Milicevic’s ‘Hedda Lillihammer’… who clearly had a bit of a girl-crush on Olive (and who can blame her?). Ep #2.11 featured Constance Zimmer as ‘Coco Juniper’, one-half of a famed window dressing duo, who came under suspicious when her colleague turned up dead. Fun fact: Zimmer was the first actress to play DA’s assistant ‘Cassie Hillman’/ ‘Cassie Thomas’ in the Mystery Woman series of TV-movies, before being replaced by Nina Siemaszko in subsequent instalments. 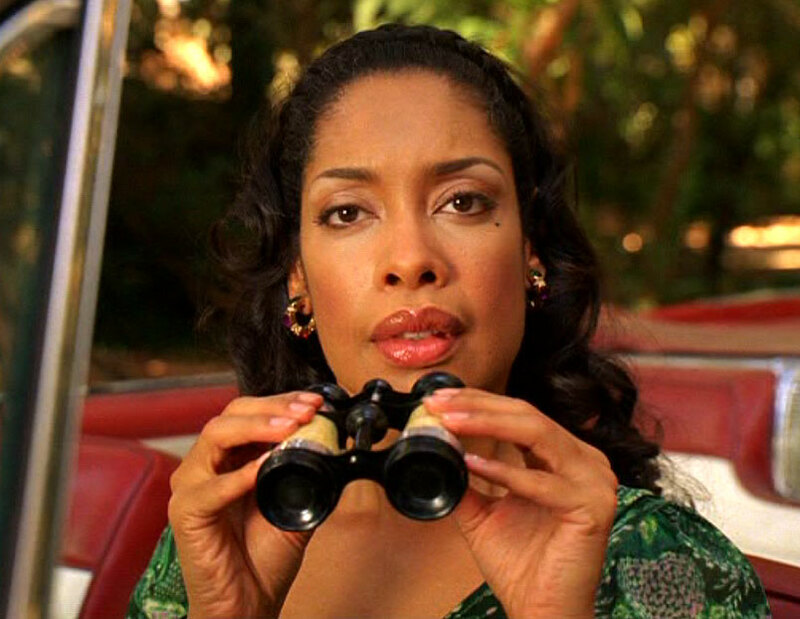 Gina Torres slunk into ep #2.12, as ‘Lila Robinson’, the grifting femme fatale who stole Emerson’s heart when she skipped town several years earlier, along with his estranged daughter. Finally, in ep #2.13, the Darling Mermaid Darlings were called back into service when a rival synchronised-sibling-swimming team was attacked by a shark during a show. The water-hoofers in question were played by Wendie Malick and Nora Dunn… while My So-Called Life’s Wilson Cruz had a cameo as an ambitious aquacade employee. Bless him. This entry was posted in Rants about TV and tagged Anna Friel, Beth Grant, Christine Adams, Constance Zimmer, Dana Davis, Debra Mooney, Diana Scarwid, Ellen Greene, Gina Torres, Ivana Milicevic, Jennifer Elise Cox, Kerri Kenney-Silver, Kristin Chenoweth, Mary Kay Place, Missi Pyle, Mo Collins, Nina Siemaszko, Nora Dunn, Pushing Daisies, Swoosie Kurtz, Wendie Malick, Wonderfalls. Bookmark the permalink.